Eiders are familiar birds around the Arran coast….at least they used to be but their numbers are declining not only around Arran but in the Firth of Clyde as a whole. See graph below. Chris Waltho a past president of the SOC (Scottish Ornithologists Club) who has a passion for Eiders, has organised surveys in the Clyde for about twenty years. Chris's collected data clearly shows that the post breeding population of Eiders in the Firth of Clyde is in decline and has more than halved in the last ten years. In the Victorian era there was a major expansion of Eider in western Scotland and this lead to the colonisation of the Firth of Clyde, which was first colonised at the beginning of the twentieth century. With an annual population growth of around ten percent by the late 1990s the Firth of Clyde held around 25-30% of the Scottish population. Horse Island off Ardrossan has one of the largest colonies in the Firth of Clyde. The reason for the marked decline in recent years is not clear. The Clyde Ringing Group and Glasgow University have ringed approximately 1500 females over the last decade. 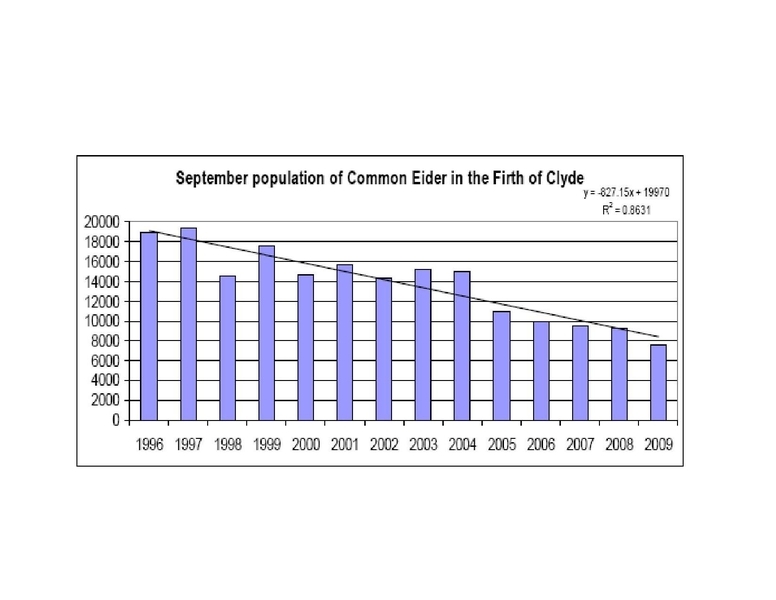 These results suggest some decline in annual survival rate, but there is little evidence of mass mortality events or of any mass displacement within or out of the Clyde. Mussels, crabs, starfish and other seabed creatures are the main food sources, with many (at least 20) different pressures and influences operating in different parts of the firth, there is no single cause for the decline. This decline is likely to be the cumulative effect of multiple causes that have an overall chronic impact on the population. It is important to continue to monitor the situation. One of the ways that this is done is through Chris's annual survey. While the Arran trend reflects the overall figures, there has been considerable variation on the Arran figures from over six hundred in 1999 to six in 2008. The better the coverage of the census area the more reliable the Arran figures will be. The latest survey will take place during the period 18-26 September. If you feel that you are able in help during this period, please contact me and I will give you more details. In addition, the Clyde Ringing Group has been colour ringing females for several years. All Clyde colour-ringed birds have a white ring on the right leg. On the left leg is a bigger colour ring, which indicates its nesting colony. If you see any of these ringed Eiders around Arran, please take a note of the colours plus where and when you saw the bird and forward the details to me. All the information will be forwarded to Chris Waltho.